While rolling and cutting dog biscuits earlier today, I heard Sophie and Coco "talking" to each other in the bedroom. Back and forth. Back and forth. It's as if they were having a conversation. Sophie would speak. Then Coco. Never at the same time. They do this once in a while and it intrigues me. I stopped what I was doing, walked to the bedroom and peeked in. Sophie was in the middle of the bed. On top of the blankets. Sprawled out. Coco wanted to get under the blankets and build his blanket fort. His head was buried. Bum sticking up in the air. Sophie's body was the blockade preventing him from being able to crawl under any further. They were bickering. Gently. I giggled. I washed my hands. They were covered in peanut butter dough residue. I moved Sophie towards the end of the bed. 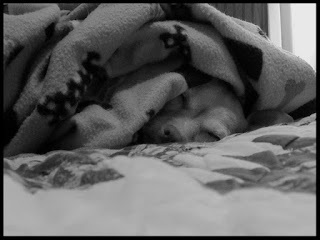 Then, I lifted the blankets for Coco. He built his fort. Sophie made her blanket bungalow. Both let out a sigh. Stretched out. Nappy time. Happy kids.